Successfully Added 4K Android TV Box T96R - 4K Support, 3D Movie Support, Android 5.1, Quad-Core CPU, Mali GPU, 2GB RAM, Google Play, Kodi 16.1 to your Shopping Cart. 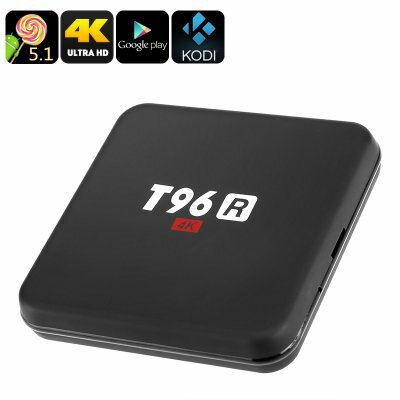 The T96R Android TV box offers a great and affordable way to bring hours’ worth of joy into your household. Supporting both Google Play and Kodi 16.1 TV, this cheap Android TV box lets you enjoy the latest games, movies, applications and more from your big screen TV. Simply connect this stunning TV box to your HD TV, sync it with your WiFi network, and you’ll be able to sit back and enjoy its abundance of smart features – turning your regular TV into one of those amazing Android SmartTVs that is sure to leave an everlasting impression with all your friends and loved ones. Supporting 4K resolution, this 4K TV box delivers Ultra-HD visuals to everybody out there that owns a 4K TV set. Watch your favorite films, the latest series, and live sports games in stunning detail and vivid color – this 4K Android TV box lets you enjoy all your media in a way never experienced before. Additionally, it also packs a sophisticated Mali 400MP graphics unit, a GPU that lets all gaming lovers among us enjoy the latest and most graphically demanding games in absolutely breathtaking video quality. Whether you’re into films, playing games, or simply like to browse the web – this Android TV box is guaranteed to meet all your entertainment demands. Thanks to its powerful Quad-Core processor that has been clocked at 1.46GHz and 3GB of RAM, this Android TV box is capable of handling the most demanding of tasks at ease. Supporting a decent 8GB of internal memory and a 16GB TF card slot it offers a respectable storage space for you to save your latest downloads. The next time your friends come over to enjoy a relaxing film night at your place, you can be sure that you’ll have plenty of the latest media to keep them entertained throughout the entire night – guaranteeing that never again anybody has to experience a single moment of boredom when visiting your apartment. Besides its 4K resolution, this Android 4K TV box furthermore supports 3D movies – truly providing you with the feeling as if you own your private cinema. Bringing along unlimited fun for yourself, family, and friends – this Android TV box is the ultimate accessory that suits the interior of any home and office alike. This 4K Android TV Box comes with a 12 months warranty, brought to you by the leader in electronic devices as well as wholesale electronic gadgets..